Grown in dozens of varieties, many perennial flowers lend gardens a tropical feel. Tall tropical flowers have their own distinct color and shape to create an exotic tropical oasis. Some tall tropical flowers are large enough to place in the back of a garden, while others are ideal lining a garden path or perennial border. With their bright, fiery colors, tropical plants create a striking landscape design. Frydek elephant’s ear (Alocasia micholitziana 'Frydek') is a summer-blooming, tropical flower with a moderate growth rate and clump-like growth habit. The giant pale stalks have purple banding and rise up to 3 feet tall to hold the 18-inch long leaf. The arrow-shaped leaves are deep green to black and have white vines shooting down the leaf that resemble a rib cage. Ideal tucked along a shaded garden border or at the edge of a tropical rock garden, Frydek elephant’s ear is a showy perennial plant. Frydek elephant’s ears prefer partial shade, but tolerate some sunlight. They require well-drained, nutrient-rich soil to thrive. Versatile Frydek elephant’s ears tolerate a wide range of soils, including varying pH levels and heavy soil. The USDA hardiness zone for planting is 9 to 11. Canna lily (Canna x generalis), a perennial flower with bright tropical colors, emerges in summer with its upright form, and lasts until the first frost. Growing 24 to 48 inches tall, canna lilies bloom in a wide range of colors including yellow, pink, orange and red. The bright green leaves on the canna lily grow 6 inches wide to create a jungle-like feel to the garden. With their tropical foliage and bright blooms, canna lilies are ideal nestled along the backdrop of a tropical garden. Drought-tolerant, canna lilies require full sun and nutrient-rich soil. The zone for planting is 8 to 10. Red hibiscus (Hibiscus coccineus) is a perennial flower with showy, tropical blooms that grow 6 to 10 feet tall and 1 to 3 feet wide. The funnel-shaped blooms are bright red and held on by upright, erect stalks. The flower heads are single to double and grow 6 inches wide. The large leaves are dark green and add to the tropical effect of the hibiscus. 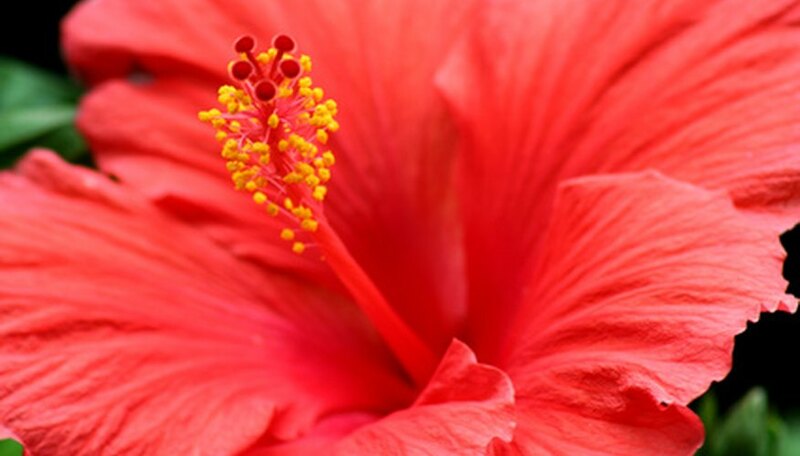 Hibiscus prefers full sun and well-drained soil that is moist and humus-rich. They prefer hot summers to produce their vibrant blooms. Tucked along the back of a garden wall, red hibiscus flowers create a showy garden presence. The zone for planting is 5 to 9.